General Craig Olson stated at the congressionally supported National Day of Prayer Task Force that God guided him and strengthened his career and the he was a redeemed believer in Christ. Soon afterward, the anti-theists wanted to have him court–martialed. Therefore, America, before feeling sorry for yourselves, I need to set the record straight. Let me remind you that it is not the ACLU or some other anti-American group or communist organization that is taking away your rights. It is the American people relinquishing and forfeiting the rights that God gave. • Students have the right to pray on a public school campus. • Students have the right to read their Bible on a public school campus. • Students have the right to form religious clubs on campus. • Students have the right to hand out tracts, flyers, or other religious material on campus. • Students have the right to do research papers, speeches, etc. with religious themes. • Students have the right to be exempt from participating in assignments that are contrary to their religious beliefs. • Students have the right to discuss religious issues even though other students may overhear them. 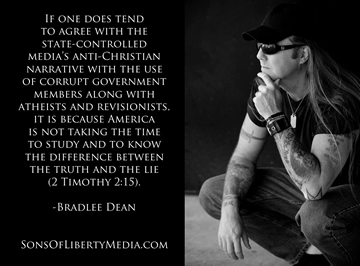 If one does tend to agree with the state-controlled media’s anti-Christian narrative with the use of corrupt government members along with atheists and revisionists, it is because America is not taking the time to study and to know the difference between the truth and the lie (2 Timothy 2:15). At least now, you know who is breaking the law (Psalm 94:20).